Apologies for the lack of posting for a while, we were hit by a bad storm resulting in a power outing and damaged phone line, but all fixed now, so it has been quite a week! To cap it all, a new female has taken the Marsh nest. She arrived on Thursday afternoon, and ousted the un-ringed female, claiming the nest for herself. What is interesting is that this bird is ringed, White KL on her left leg, what is amazing is that she has been seen and photographed in Senegal in 2011 and 2012 by colleagues from the Rutland Osprey Project! She was ringed near Loch Arkaig in Inverness-shire on 19/06/09, so at four years old this could be her first year of breeding, fingers crossed. Our un-ringed male seems to have also been charmed by her, as he has been mating with her and bringing lots of fish to the nest, with no sign of the un-ringed female she has ousted. 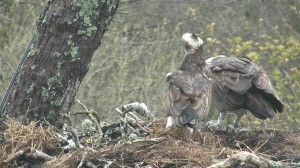 The photo shows KL on the right hand side and the male on the left. As spring takes hold on Bassenthwaite Lake our Ospreys are looking more and more settled. The female has been spending long periods of time sat on the nest, whilst the male perches near by. This behaviour suggests that we should be seeing eggs any day now, so we are keeping our fingers crossed! Mean while, we have had frequent sightings of other Ospreys from the view points at Dodd wood. Our pair seem to be showing some resilience however, and have been chasing off any unwanted company. Stormy weather but fish still coming in. Storm clouds were plentiful over the nest site this morning, horizontal rain with strong winds from the south, but still our gallant Ospreys managed to bring in the fish. Two were consumed before lunchtime. 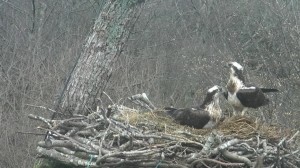 Meanwhile the Ospreys continued to do what Ospreys do at this time of year and we hope for eggs early next week. Birds still on site ! In order to continue to improve our site, we will soon be archiving our Flickr Diary and posting straight onto the ospreywatch website. This should be more user friendly, stay in chronological order and be more accessible….watch this space ! Also, we are planning to run a social media feed on the site, so you can therefore see both our facebook and twitter posts.